The Finger Lakes wine region of New York State has been lauded for the last couple of decades for the fine work they have accomplished in wine making. Even the “Wine Spectator” magazine that I have subscribed to for years lists many of the different wineries and their output throughout the year, which is something that the State of Michigan has been ignored for, since I have been a subscriber. One of the first books that I purchased for myself, when I began studying wines as a hobby was The World Atlas of Wines by Hugh Johnson and published in 1971. I may venture to say that many of the Wine Bloggers that I follow may not have been born, as Blogging seems to be a more youthful endeavor. This atlas is 370 pages of maps, information and wine labels; and I have found it to be very useful over the years. Of course the problem with any atlas or map is that it is old, by the time it is published, because things change, the world is dynamic and in constant flux, even for wine. To give you an idea, there are only two pages devoted to the Finger Lakes when this book was published. To put this in a more perspective view; the states Oregon, Washington, Missouri, Ohio, Maryland, Virginia and the province of Ontario share one paragraph on the two pages devoted to the Finger Lakes. While the information about the area for wine is positive, to the young naïve reader that I was back then, it kept me from searching for the wines, and to be honest, there is very little of New York wines to be found on the shelves or wine cartes here in Michigan. 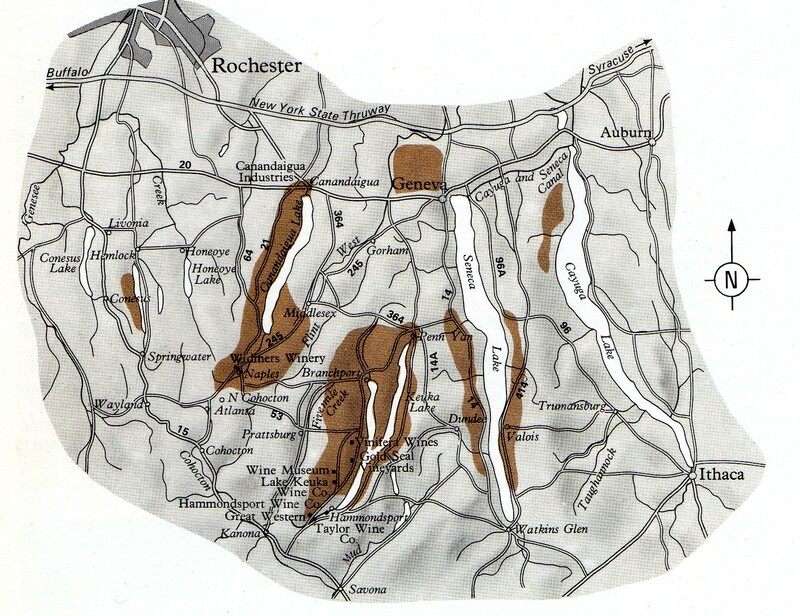 The main thrust of my reading about the Finger Lakes besides the fine work of a few vintners was the varietals that were being used; Baco Noir, Catawba, Chelois, Concord, De Chaunac, Deleware, Duchess, Elvira, French American, Isabella, Moore’s Diamond, Niagara and Seyve- Villard. These varietals are what are grouped together as Cold Hardy Grapes, and it has only been recently that I have really tried some of these varietals myself, as they are also popular in Michigan and Ohio. As I was a “wine snob” in my youth, before I knew any better, is it any wonder that I did not go out of my way to try these wines. I only knew New York State for their sparkling wines, and then only for the biggest producing winery of the area Pleasant Valley Wine Company and their Great Western Extra Dry New York State Champagne NV. The more I learn about wine, the more I realize how much I do not know and hence the thirst for more education and more wine continue. 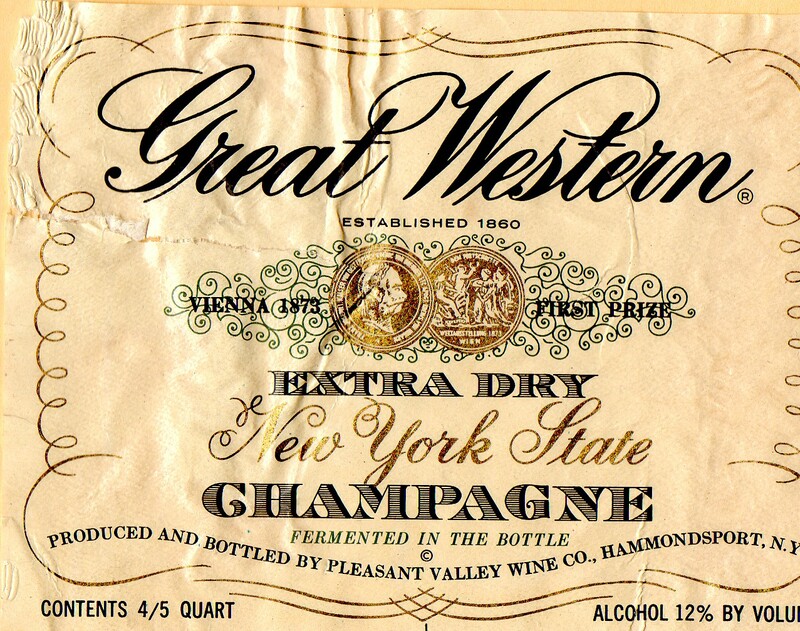 This entry was posted in Wine and tagged Champagne, Cold Hardy, Great Western Winery, New York, Pleasant Valley Wine Company. Bookmark the permalink.